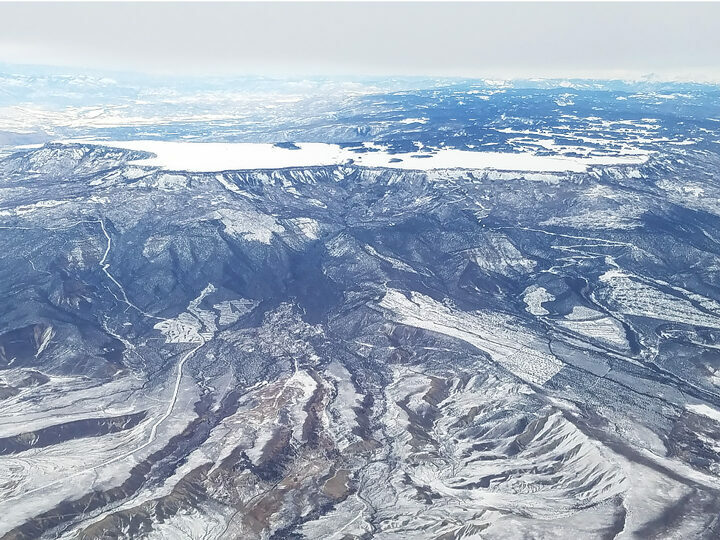 Colorado’s Grand Mesa as viewed from a commercial airline flight departing Grand Junction, 5 December 2018. Ground validation measurements are an important part of working with remote sensing instruments like SWESARR. Snow is dynamic and changes occur as soon as it settles to Earth’s surface. In a dry, windy place like Colorado’s Grand Mesa, snow can move around, be packed into drifts, get intercepted in canopy, sublimate back into the atmosphere, and metamorphose into depth hoar as winter progresses. 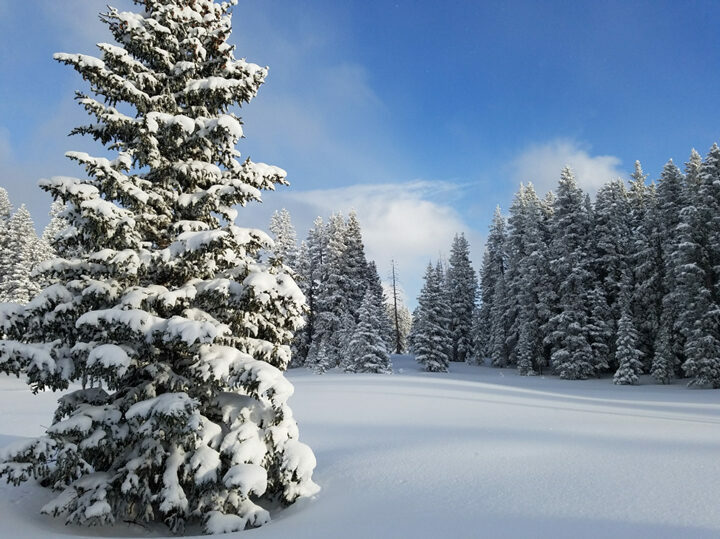 Fresh snow blankets Grand Mesa’s trees and ground during an early-season snow measurement campaign. In the week before we arrived, there was 40-70 cm of new snow. Ludo Brucker (NASA GSFC / Universities Space Research Association) and Chris Hiemstra (Cold Regions Research and Engineering Laboratory) were on Grand Mesa preparing for NASA SnowEx 2019. 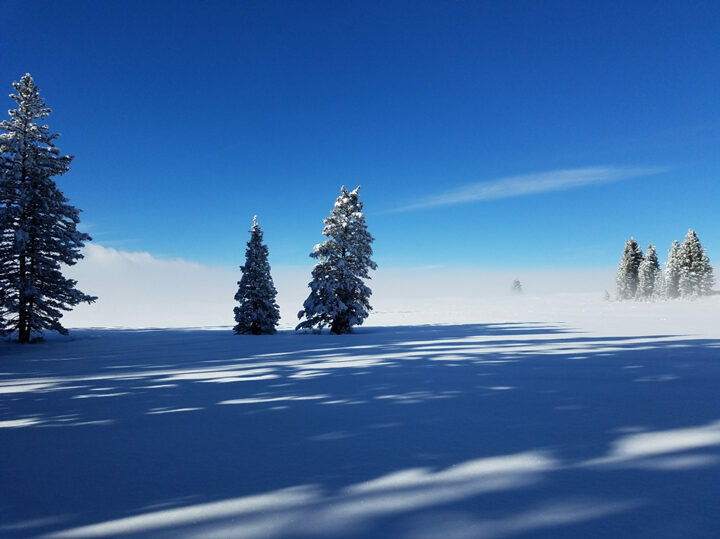 During the latter half of November 2018, Grand Mesa was blanketed in 40-70 cm (about 15-27 inches) of new snow from a series of storms. Fortunately, a short break in the weather with clear skies was forecast for the last SWESARR engineering flight. Optimistic plans to take early season measurements on Grand Mesa materialized. Mike Renner, Grand Mesa Lodge, groomed Grand Mesa’s snowmobile trails for the first time late into the previous evening, which aided our one-day measurement campaign visiting radar corner reflectors used for SWESARR assessment and making measurements under the flight lines. The only problem was that the flight lines were well out into the west end of Grand Mesa and the early season snow was new and deep. Chances of getting stuck on the way out there were high, especially as the route went uphill from Grand Mesa Lodge perched on the south side of Crag Crest. 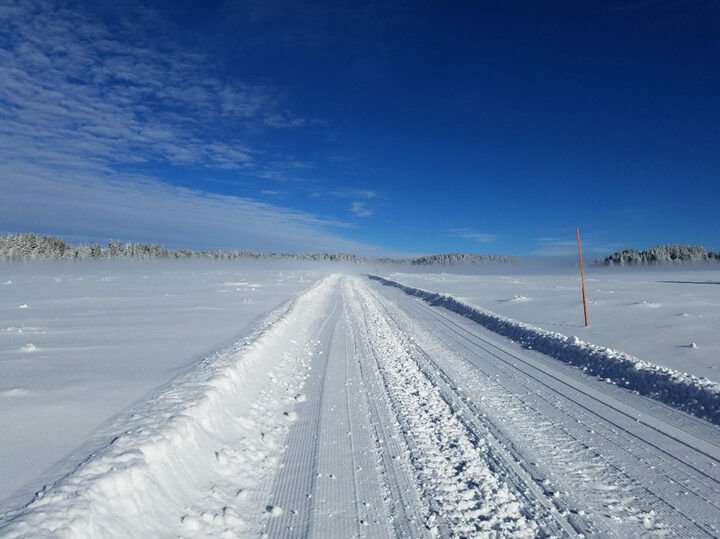 Fortunately, Grand Mesa Lodge owner Mike Renner grooms Grand Mesa snowmobile trails throughout the winter season and he groomed a route out to the west side of the Mesa the previous evening. On the morning of December 4, Ludo and Chris rode 11 miles to the west end of the Mesa. 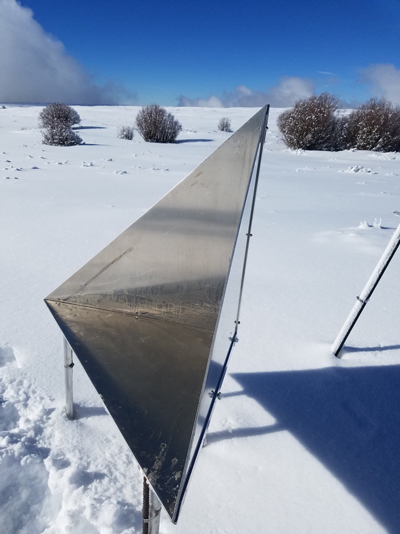 A radar corner reflector on Grand Mesa was cleaned for the flight. Reflectors are used to return strong radar signals back to the aircraft. Just as they arrived in the blazing sun, the drone of the Twin Otter carrying SWESARR and flying one of the lines could be heard. They cleaned out the radar reflectors, then set about collecting snow data. The corner reflectors are used to assess the airborne radar observations. Ludo measured snow density and temperature, as well as snow stratigraphy and grain size information. This early in the season, snow under the tree canopy is markedly lower than elsewhere on the Mesa. Not much movement of snow occurs early in the season as long as vegetation holds it. Much of the snow here remains in the canopy above, which will drop, melt, and sublimate over coming weeks. Chris used a magnaprobe, an automated snow depth measurement device that records snow depth and GPS-location into a backpack mounted datalogger. In all, five snow pits were performed and over 1500 snow depths were measured at various points along several pre-determined flight lines. Colorado’s Grand Mesa is a high elevation surface covered in shrubland, meadows, and trees. 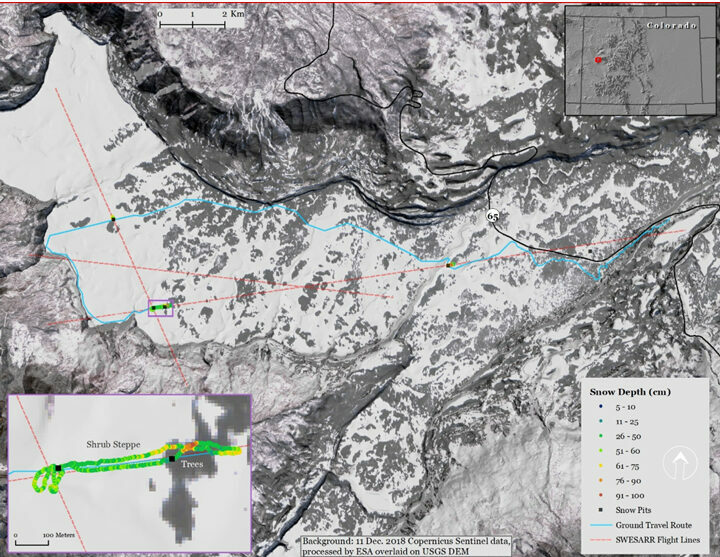 Three SWESARR flight lines were distributed over the Mesa and ground observations and travel are indicated. Trees (inset) have a pronounced impact on snow depths, with snow depths low directly under the canopy and much higher adjacent to tree canopy. 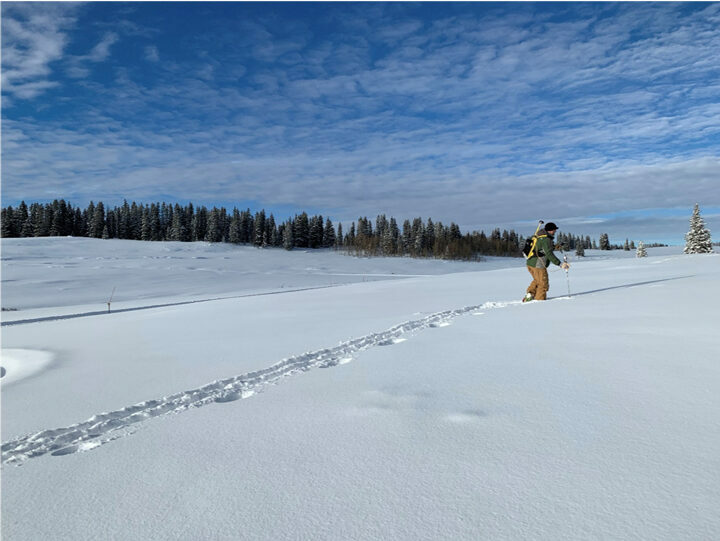 After a week of snowfall, welcome clear and calm conditions resulted in an outstanding day collecting ground-truth data useful for assessing instruments and algorithms for the early-season snowpack. Snow, wind, trees, and topography interact to determine snow depths on Grand Mesa. Fog rolls onto the west end of the Mesa. SWESARR flew two more flights before coming home. The second-ever SWESARR flight was on December 3, 2018, and the third flight was on December 4. 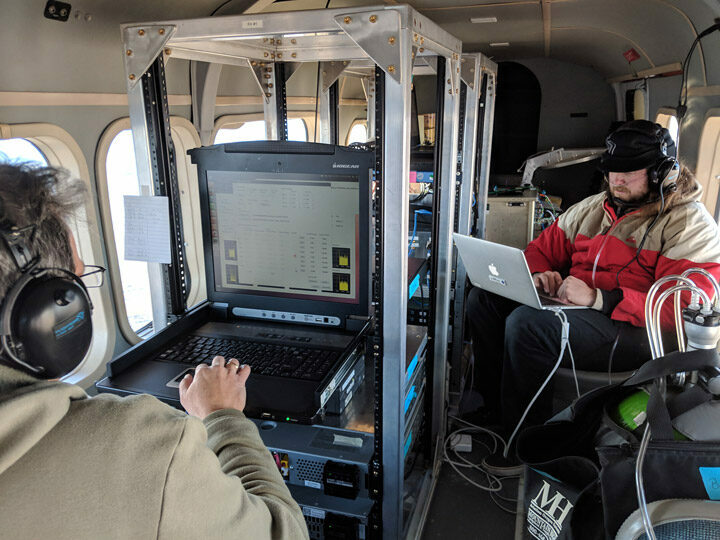 The weather conditions on December 3 did not allow the aircraft to fly over Colorado’s Grand Mesa, so we used that flight opportunity to update the instrument parameters and nail down the settings before a flight to the mesa. On December 3, we also changed the flight crew a little bit. Quenton Bonds, Rafael Rincon and Chase Kielbasa flew on the aircraft collecting data around the airport. The main difference between these flights and the first flight was that the roll compensation sensitivity was reduced by 20 percent to compensate for the aircraft roll without being sensitive to the aircraft vibration. Also it snowed between Sunday and Monday, making the imagery a bit more scenic and relevant to SWESARR. Pre-flight preparations are completed on the shore-power with an extension cord, before the aircraft power becomes available. The Uninterruptable Power Supplies keep the systems operational during the power source switch. Using the data from December 3, Tobias Bollian was able to generate first geocoded and first-cut motion compensated images from SWESARR. Without the precise GPS clocks the accuracy of the motion compensation and geocoding are not ideal, but they confirm that the instrument parameters are reasonably well defined. 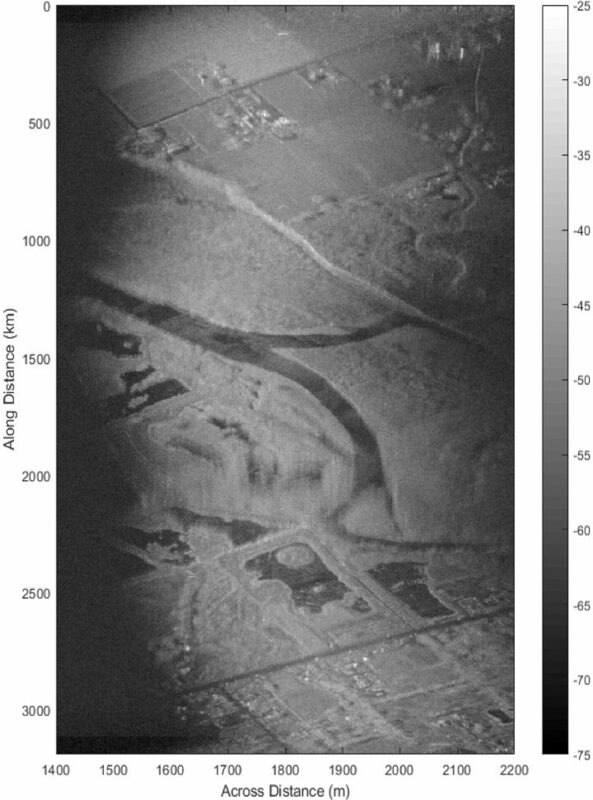 For these images, the resolution is kept at 2.5 meters, even though the instrument’s native resolution can support about 1-meter resolution. 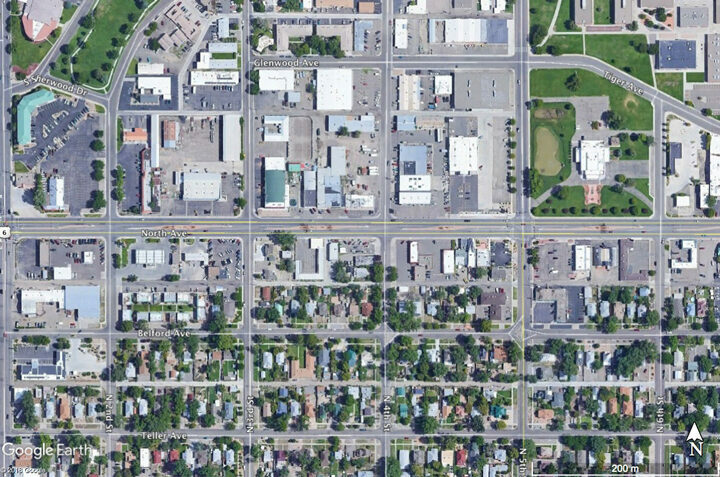 Geocoded SWESARR Ku-High (17.2GHz) cross-pol imagery over Grand Junction. The resolution is kept at 2.5m. The streets and buildings are clearly visible. 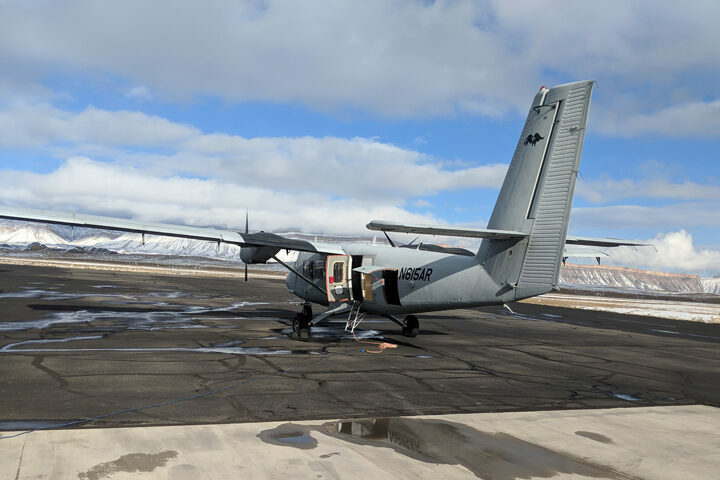 The next day, the weather was good and team was ready for a flight over the Grand Mesa. 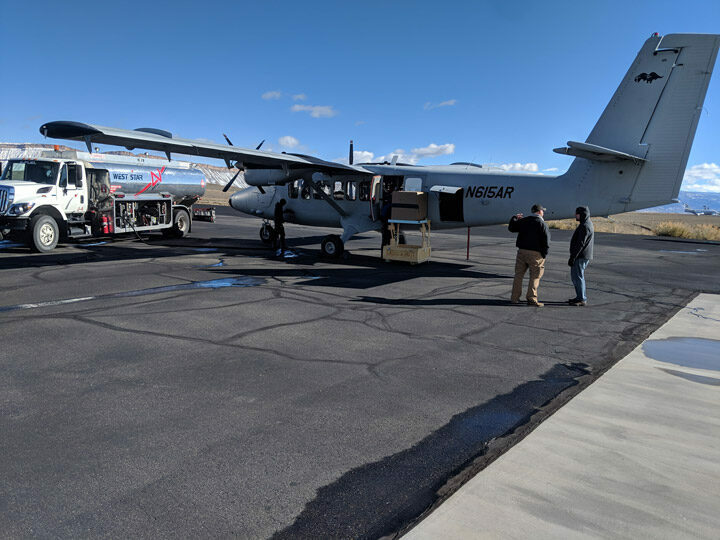 SWESARR team member Ludo Brucker, and SnowEx team member Chris Hiemstra were also on the ground to support SWESARR flights over the Mesa. Flight lines were coordinated in advance so that ground and air teams could collect data over the same areas. 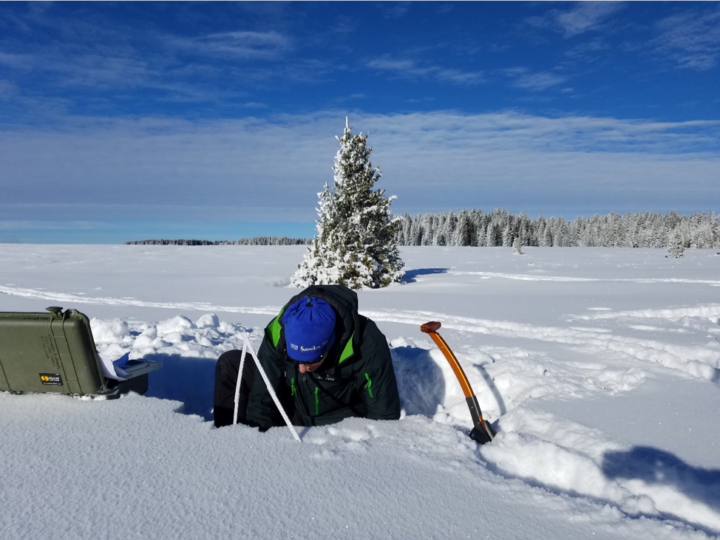 Ludo Brucker and Chris Hiemstra dug snow pits and measured snow depth on the Grand Mesa. 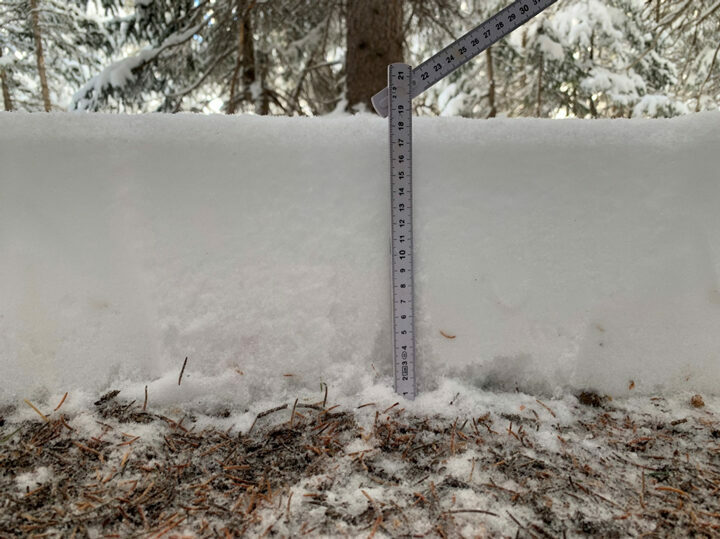 At certain points the snow depth reached 73 centimeters. These data will be crucial to validate SWESARR active and passive microwave measurements. 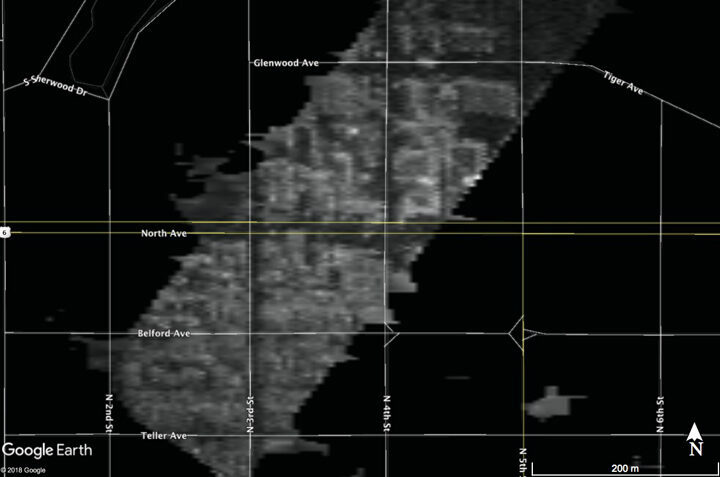 Preliminary images over Grand Mesa around the intersection of Forest Service (FS) 100 Rd and FS 44 5/10 Rd show a partially frozen lake in these radar images from December 4, 2018. The areas where liquid water remains appear dark, while most of the lake has a much brighter backscatter. Because a single antenna is used for three different frequencies, the illuminated swath changes from about 600 meters to about 300 meters from X to KuHbands from an altitude of 1500 meters above the ground level. Rafael Rincon processed a set of imagery demonstrating measurements on all active bands of SWESARR. 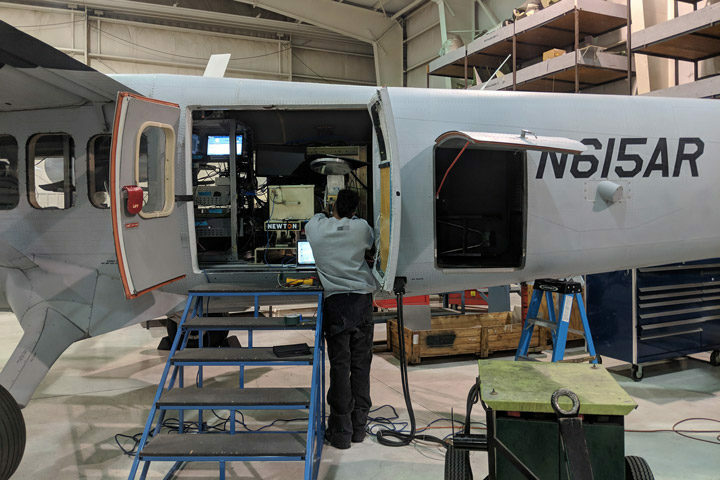 Thanks to the dedicated work of the NASA Langley Airworthiness and Safety Review Board, SWESARR was cleared to fly Friday afternoon (November 30), and was able to conduct its maiden flight on Saturday December 1, 2018. The flight took place around the Grand Junction airport, and lasted just over 2 hours. During that time, the radar collected data at 1500, 2000, and 3000 meters above ground level (AGL) in various radar operation modes. 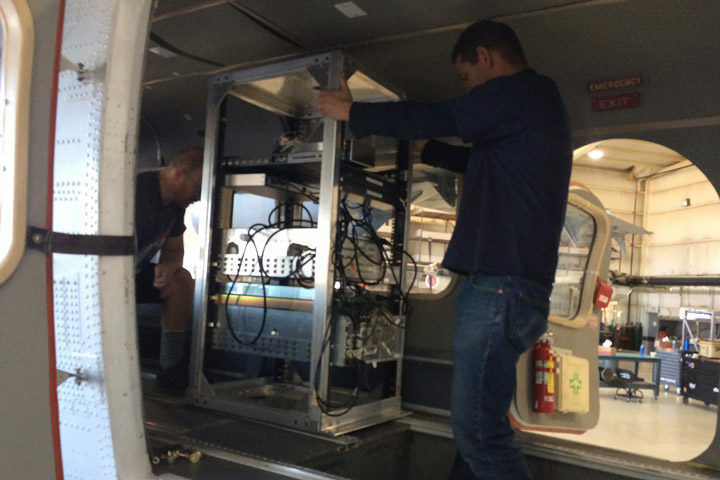 The Twin Otter aircraft is getting fuel for the SWESARR flight, while Quenton Bonds is taking radiometer calibration measurements. James Jacobson from NASA Ames is discussing the Applanix boot procedure with pilot Grant Frost. First flight went as expected with minor issues to tackle, verifying the instrument operation, and tweaking parameters. At all times beyond 10,000 feet MSL the crew used additional O2, per NASA regulations. At any given moment, there was always a lot to do for the three qualified non-crew members (a.k.a. the scientists and engineers). 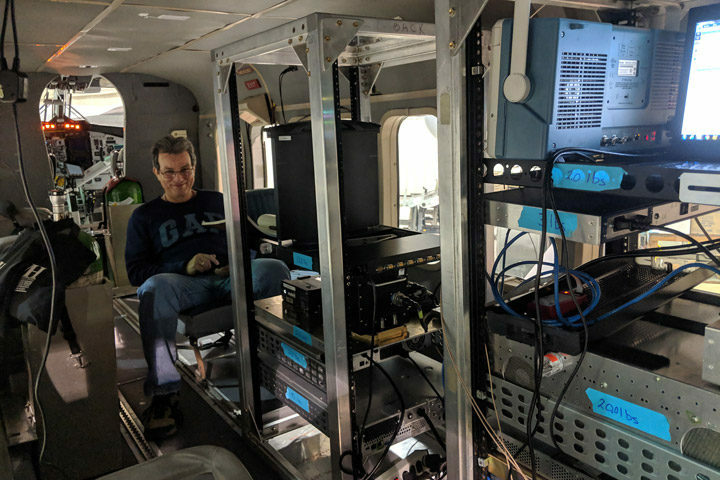 Rafael Rincon is setting up the instrument parameters, while keeping a keen eye on the signal levels coming in at all times. Chase Kielbasa, is monitoring the radiometer measurements. 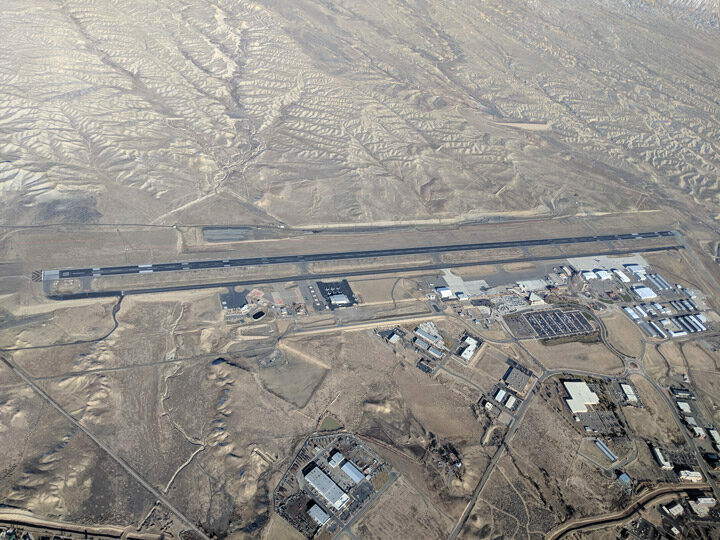 Grand Junction Airport from the air. Four corner reflectors (radar calibration targets) at different sizes are installed in the field, visible in the middle of the image. After the first flight, the team got the data off the computer and started processing the hours of data that were collected. Data analysis continued on Sunday, to take a hard look at the data quality and instrument performance. The analysis will continue when the team is back at Goddard, but all indications are positive. The hard efforts of two team members, Rafael Rincon in the field, and Tobias Bollian at Goddard, are producing good results as the first images from SWESARR radar start to come in. The team is analyzing the images to tweak the instrument parameters to achieve best image quality. Preliminary image by Rafael Rincon, showing X-band Co-polarization imagery. Motion compensation is not applied to this image, and effects of airplane motion can be seen as the variation in near-range distance and blurring at along-track dimension when the aircraft motion was too strong. Application of motion compensation will remove such artifacts.